Humana’s Bold Goal is to make the communities we serve 20 percent healthier by 2020 by making it easier for people to achieve their best health. Four of our original seven Bold Goal communities (Knoxville, Baton Rouge, New Orleans and San Antonio) demonstrated improved Healthy Days due, in part, to strong relationships between physicians, patients and their communities. Humana employees accumulated 1.8 million more Healthy Days over the last five years, achieving an 18 percent overall improvement toward their Bold Goal. LOUISVILLE, Ky.--(BUSINESS WIRE)--Humana Inc. (NYSE: HUM) announced today the progress the company has made in achieving the Bold Goal it first publicly announced in 2015. Humana’s Bold Goal is a comprehensive health and business strategy to improve the health of the communities it serves 20 percent by 2020 by making it easier for people to achieve their best health. As part of its annual commitment to provide an update on its community health progress, Humana today is releasing its “Bold Goal – 2018 Progress Report,” which can be accessed by clicking here. Humana is focused on partnering with local physicians and community organizations to address important physical and mental health conditions as well as social determinants of health (food insecurity, social isolation and loneliness) in its Bold Goal communities. The progress, challenges and results from their original seven Bold Goal communities are detailed in this report. Humana measures Bold Goal community progress using the U.S. Centers for Disease Control and Prevention (CDC) population health management tool known as Healthy Days, which takes into account the whole person by measuring both mentally and physically Unhealthy Days over a 30-day period. Humana research has demonstrated that each Unhealthy Day adds $15.64 per person per month in medical costs, underscoring the economic value and business imperative of achieving the Bold Goal. In 2017, Humana turned its focus to individual population reporting within their communities, which provides the company with a more in-depth look at trends and needs of senior, working-age and lower-income adults as well as those struggling with conditions like diabetes and depression. The Bold Goal Progress Report details how and why Humana narrowed its focus and aligned its interventions around key social determinants of health, such as food insecurity, social isolation and loneliness, which are associated with adverse health outcomes. The shift in focus to tracking unique populations within their communities allows Humana to identify areas where they are making progress, and to challenge the company to do better where they have yet to see improvement. In this spirit, Humana is moving away from providing an all-in Healthy Days average for each community, opting instead to increase the granularity of their reporting to shine a light on populations that need increased attention. 2017 was a particularly challenging year for health in the United States. The annual Gallup-Sharecare Well-Being Index showed that 21 states saw “declines in social, emotional and psychological health.” Despite these challenges, Humana’s senior member population in Bold Goal communities continued to improve their health when compared to those senior members in non-Bold Goal communities. Bold Goal markets, on average, managed to reduce their number of Unhealthy Days. Knoxville, Tennessee; Baton Rouge, Louisiana; New Orleans and San Antonio all had improved Healthy Days as well as improved clinical outcomes. Humana attributes this, in part, to strong relationships between physicians, communities and patients. Seniors living in Bold Goal communities continued to make improvements in physical and mental health. Despite the fact that many of these Medicare members are living with multiple chronic conditions, a reduction in Unhealthy Days was achieved. Humana employees reduced their number of Unhealthy Days, improving overall by 18 percent. In 2015, Humana announced an ambitious Bold Goal for its employee population: improve health 20 percent by the end of 2017. Achieving results within two percent of the original goal, Humana employees were able to gain 1.8 million more Healthy Days in total. The Bold Goal continues to guide employees in their work and shared sense of purpose. Eighty-seven percent of employees surveyed say they are inspired by the Bold Goal, and in Bold Goal communities, employees show higher rates of volunteerism, engagement and retention. 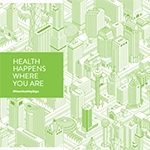 Through a “whole-person” approach toward health and well-being improvement, Humana’s experience and success within its employee population has also accelerated deeper understanding of how social determinants of health impact our communities. Humana is highly focused on addressing how social determinants of health -- such as how food insecurity, social isolation, loneliness, health literacy and transportation -- can greatly impact a person’s ability to improve his or her health. Today, one in eight Americans is food insecure, and seniors who are food insecure have 50 percent higher prevalence of diabetes and three times higher rates of depression. Further, seniors who are socially isolated or lonely are 3.4 times more likely to suffer depression. Roy A. Beveridge, M.D., is Humana’s Chief Medical Officer. His organization has been responsible for leading Bold Goal implementation for the last few years. Dr. Beveridge believes that more attention must be dedicated to not only expanding the role of physician and clinician partners, but also helping them to address social determinants of health. In Florida, we are working on several diabetes pilots with a diabetes management company to provide eligible Humana members with an opportunity to participate in a self-management program with a certified diabetes educator. These interventions target diabetic members who have an A1c equal to or greater than eight. Due to the work and influence of our Bold Goal, the program also includes Healthy Days, food insecurity and loneliness screenings as a part of the program, taking a holistic approach to health to improve health outcomes. San Antonio continues to improve its Healthy Days through a highly collaborative approach. In Humana’s first Bold Goal community, the San Antonio Health Advisory Board and Humana San Antonio Bold Goal team partnered to achieve a 3.5 percent improvement in Healthy Days. In 2018, Humana and the community will be focused on scaling efforts aimed at diabetes and food insecurity. Baton Rouge benefited from strong collaboration between the public and private entities. The community experienced a 4.1 percent improvement in Healthy Days and a 1.8 percent improvement in Healthy Days among Humana seniors with diabetes. In addition, the Greater Baton Rouge Health Advisory Board and the Humana Baton Rouge Bold Goal aligned with the Mayor’s Healthy City Initiative to further impact the community. New Orleans improved their Healthy Days 3.9 percent, which has been attributed to a specific focus on healthy eating and nutrition literacy. In 2018, the Greater New Orleans Health Advisory Board and Humana New Orleans Bold Goal team will dedicate more attention to convincing additional physicians to enter into value-based care agreements as well as addressing food insecurity, loneliness and social isolation. Knoxville achieved a 5.4 percent improvement in Healthy Days, the largest improvement in all Bold Goal communities and a 9.7 percent Healthy Days improvement in Humana members living with diabetes. The Greater Knoxville Health Advisory Board and the Humana Knoxville Bold Goal team held healthy eating demonstrations, conducted poverty simulations, tackled access to care and focused on patient engagement and diabetes prevention. Louisville, Kentucky; Tampa Bay, Florida; and Broward County, Florida, saw slight increases in Unhealthy Days. Humana detailed in its report what the company and their partners are doing to better address their unique challenges and work to reduce the number of Unhealthy Days in these communities moving forward. Humana and its physician and community partners will continue to take a highly personalized, deeply integrated approach to individual health that goes beyond the doctor’s office to address issues such as social determinants of health. Based on past experiences, new programs will be unveiled to make it easier for people to live healthier lives, both physically and mentally. Please visit www.humana.com/boldgoal for additional information on Humana’s efforts and to learn how to get involved in one of their community Health Advisory Boards.